When my favorite team is not in action I tend to watch matches in a very particular way. With a two-screen set up, I have a chosen match that I believe would be most entertaining or perhaps one that has an interesting story-line on one screen, and on the other a simulcast if one is available in order to catch as much action from the other matches as possible. Yesterday my "feature match" screen was tuned onto the Germany versus Republic of Ireland match and I was not disappointed with the action so in my mind that was the fixture that was going to stay on for the rest of the match. When my simulcast screen joined action in Belgrade it was because Albania had just nearly scored and only a leg save by the Serbian goalkeeper kept the visitors off the board. When the Albanian player went to take the corner-kick, flares were thrown by the Serbian supporters towards the footballer readying to take the kick. While I still did not have any second thought to change my other screen, I did have one thought running through my head; why the hell would you throw flares at an opposing player when the score is 0-0? How stupid do you have to be to risk an automatic loss for your team when they seemed to have the opposition on the ropes almost the entire time leading up to this poor decision by the fans? To say I was surprised would be a big lie. I am familiar with supporter groups in the Balkans and Eastern Europe and this is not more than a normal occurrence for matches in this particular geographical area. But my mind started to drift more towards the idea that it seems some of these "supporters" don't know the difference between club/country pride and sheer stupidity. Perhaps the Albanian supporters did not help the cause by flying a large Albanian flag with a map of "Greater Albania" banner suspended from a remote-control operated drone right above the center of the pitch, but the violence from the Serbian side and the flares thrown at the Albanian footballers started well before that incident. On a side-note: not to piss-off any Serbians here, but the drone idea was one of the most creative Tifo creations I have seen in a long time. 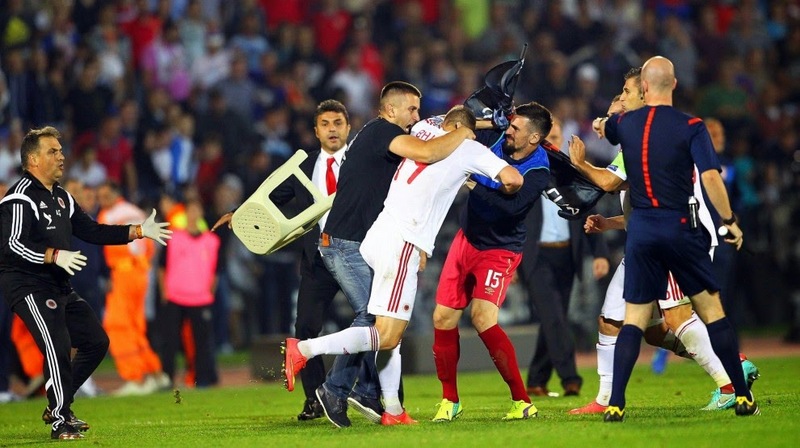 When Serbian defender Stefan Mitrovic got a hold of the banner and ripped it from the flying saucer, the Albanian players reacted with some shoves and all hell broke loose. A brawl between the opposing players and a few supporters that made it onto the pitch made English referee Martin Atkinson call the match in the 41st minute. So the big question still is in the air; who's at fault?